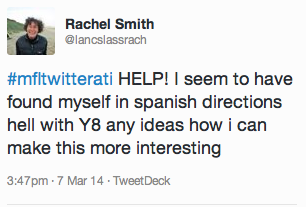 I am not a fan of the text book as many of you know so when the time came to teach directions to my Y8 class in Spanish I turn to twitter for some inspiration. In the end I plumped for an iPad idea from @joedale. 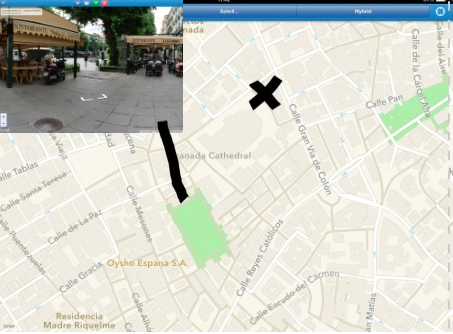 I decided to use live street view app plus book creator to create a book of directions to places from our chosen Spanish city of Granada. Students used the live street view app to have a virtual look around the city, I tried to contain them to the area surrounding the cathedral as this was going to be our starting point for giving directions. 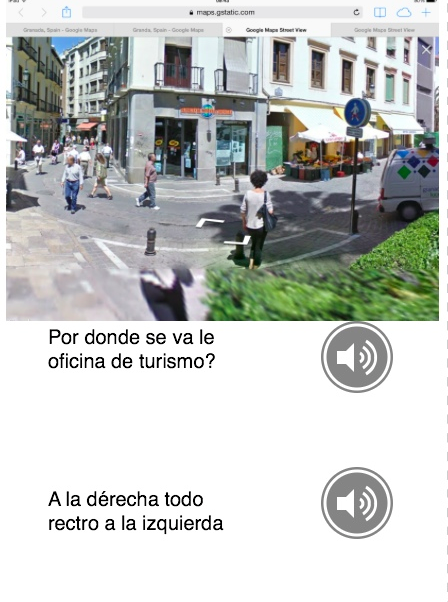 In this app when you touch on an area of the map a google street view image appears enabling students to have a virtual look around the city, which they loved. I tried not to get to annoyed about this “off task” activity as I felt it was an essential element of the cultural aspect of the lesson. For me the in class activity hit all the buttons for me, speaking, writing, working collaboratively plus a cultural aspect too. The students really enjoyed this activity especially the ability to be able to look around the city of Granada, I have to admit, we got side tracked at times as we used the sphere app to look inside the beautiful Alhambra. The fun didn’t end there though. As you may have noticed the student’s work that I have shown still has mistakes in it, this was deliberate because after the lesson I combined all the books the students had made into one and then went on to create a google form containing questions about the information in the book. Sometimes they were asked to correct mistakes, other times finish of sentences that were left incomplete by their fellow students. Once we had got over some sharing issues this activity worked well, in fact I would say that this was the best bit of the whole thing as it made the students look carefully at what they had all written and said it was a great way to “feedback” to them. I then marked the google form using Flubaroo which made the whole thing easy peasy and shared the results with the class via email.